Think about a time a speaker or presentation made a lasting impact on you. What do you remember about what they said? Was it an interesting statistic or fact? Probably not. Stories are what stick. Not all stories are created equal, though, so it’s important you craft yours carefully for the biggest impact. It will help improve your email engagement rates and can also result in more donations. There was a nonprofit with a mission to support a cause and improve the lives of others. Whatever the passion is that got your organization started should be the theme behind all of your storytelling content. Think about why your nonprofit does what it does, instead of just what you do. For example, if your group builds water wells for people in third-world countries, share why that’s important — like how that helps provide clean water, improve their health, and saves lives. That approach helps make your story about who you’re helping, instead of focusing on your organization’s accomplishments. And when you talk about your passion for the cause, it gets others excited about it, too. You can always work in an infographic or stat about what all your group has done, but remember people want a story. Your email content should create and share an experience your subscribers want to be a part of and support. To drive home your mission even more — and put a personal touch on it — highlight a person who has been positively impacted by your nonprofit. That can be someone within your organization or a person your group has helped. 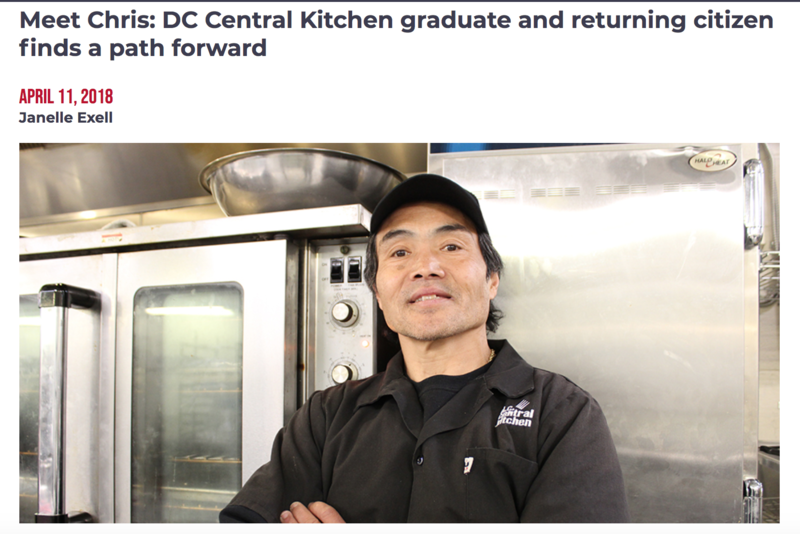 An organization that does a good job with this aspect of storytelling is D.C. Central Kitchen, which is the country’s first community kitchen. They share regular stories about the people who come into the kitchen and how their lives have been changed. You can read an example about one man’s journey since enrolling in their program for inspiration. People connect to other people’s stories, especially if they have similar experiences or emotions. You can use photos and videos of them to make your email subscribers even more invested in their stories. If you have additional media or information that won’t fit in the newsletter or update, you can create a blog or other landing page and link to it in your email. Every good story has a few things in common: an opening hook, plot, and some sort of ending or resolution. While you can’t write a novel (less is more when it comes to email marketing), you can still share these main components to get your message across. Your opening text — which includes your subject line — needs to catch the attention of your targeted audience. You can do that by asking a question or making a bold statement to build interest. From there, start sharing details about the problem your nonprofit works to solve. Use descriptive words to help readers visualize your story. For example, if your organization works to bring the arts to students, you could share the negative impacts children experience who aren’t exposed to the arts. Use anecdotes to leave a lasting impression on your email subscribers. Then, describe your nonprofit’s answer for how to fix this problem. We all love stories with happy endings, so here’s your chance to share how that’s possible with their support. Also, don’t be vague about what it will take to bring about positive change. Think of your email storytelling like a picture book. Images, videos, or other visual components will bring your message to life and make your message memorable: 65 percent of users like emails that are mostly made up of images. 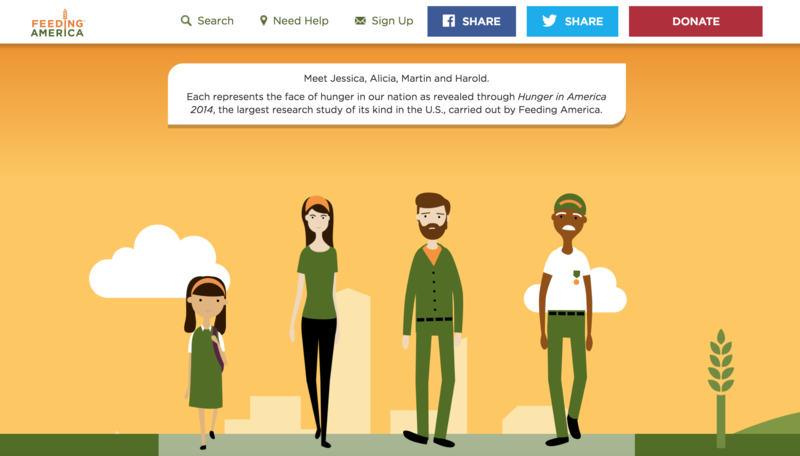 Hunger-relief organization Feeding America created an entire campaign around interactive images, which can be seen on their website and emails. It ties in people’s stories, a responsive design and interactive images. Try to avoid stock photos when telling your story through email so people can get a genuine sense of the nonprofit. Pictures of people (or animals) are especially impactful, so find ways to make these prominent in your design. To bridge the connection between storytelling and donations, first you need to think about why people give. Some of the top reasons are because they want to feel good about helping others, there’s a benefit for them (ex. reward, discount, tax deduction), and they want to be a part of the story. Your task is to tell your story in a way that makes them want to be involved. Try sharing different types of stories — ones focused on people, your mission, or an employee’s backstory — throughout your email campaign to engage a variety of subscribers. That way, one of your approaches is sure to hit home with all of your supporters. The better you’re able to connect with their hearts and minds, the better your chances are to earn their donations. Tap into your customer personas to craft a story that will best engage them. This approach has a long-term effect because stories stick with people for longer, which helps them to think about your nonprofit well after they’ve stopped reading your email. While immediate donations are ideal, you also want your message to resonate with those who might not click to donate right away. When you use the storytelling approach in your email marketing campaigns, you’re adding another tool that can help you build relationships with your subscribers, get your message out there, and earn more support for your nonprofit. It does take a little time to master the craft of storytelling. If you’re stuck, hit up this Ted Talk for inspiration. Once you get to the heart of your nonprofit’s mission, you’re on the right track to connect with your supporters and give your email marketing strategy a happily ever after.